In Fairfax/Falls Church – Friday and Sat at 7:30 PM – Last Two Performances: “You Can’t Take It With You” at The James Lee Community Center Theater 2855 Annandale Road, Falls Church 22042. “You Can’t Take It With You” – The comedy classic from The Providence Players. A brilliant, warm-hearted and critically–acclaimed comedy that is one of America’s best. Join Grandpa and his good-natured, though eccentric, family as they meet the stuffy and more conservative Kirbys – nothing but hilarity ensues. This revival of PPF’s very first production is a Pulitzer Prize winner and tremendous fun for all ages! $18 adults, $15 Students/Seniors. http://providenceplayers.thundertix.com/ , providenceplayersticket@cox.net 703-425-6782. 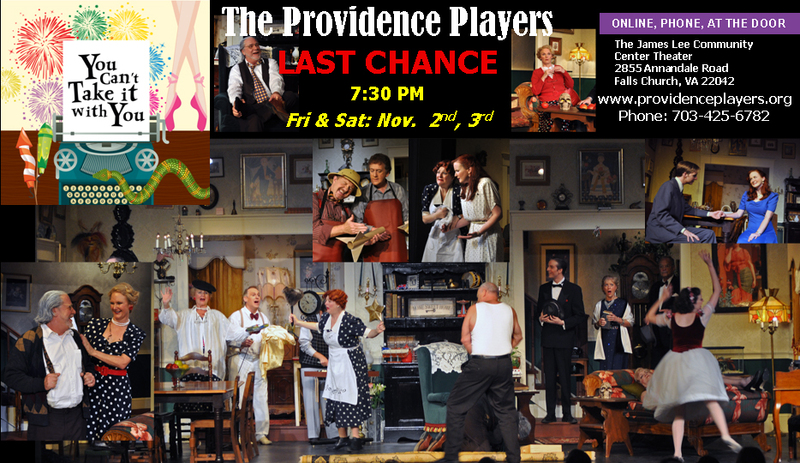 Last Chance For Season Tickets: online at www.providenceplayers.org and at the door. The Nov 3rd performance will be sign language interpreted.